Opportunities are the active deals you are working on with companies/contacts in Spiro. You can record and easily update opportunity information such as the amount, expected close date, sales stage and more. Always search for a company or contact before creating a new one to prevent duplicates. If the company or contact already exists in Spiro, you can use the global search at the top of Spiro to find the company/contact you would like to create an opportunity for. Once you find the company or contact, scroll to the bottom of the page under Opportunities and choose the "+" sign to add a new opportunity. You can create multiple opportunities for a contact or company. Fill in any Opportunity details and hit save. 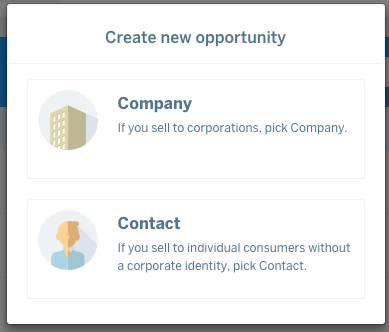 We recommended creating the opportunity with a contact because Spiro will allow you to enter information for the company, contact, and opportunity from one screen. You can also view a list of opportunities from the Opportunities tab in Spiro and search for an opportunity using the global search or the page specific search from the opportunities tab.